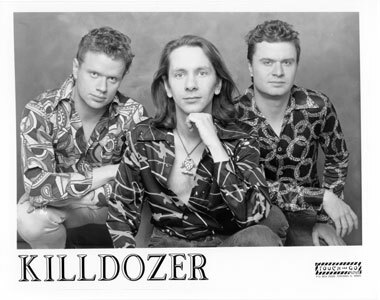 Killdozer, natives of Madison, Wisconsin, began an epic thirteen-year career in the early eighties. They started out as a harsh underground trio of Michael Gerald (bass/vocals), Bill Hobson (guitar), and Dan Hobson (drums) that combined elements of primitive country blues with distorted Birthday Party style antics. In 1987, their third full length, produced by Butch Vig, saw them evolve into a slower more experimental style of musical drudgery, still always keeping with their wrong side of town meets Communist Manifesto lyrics. In 1989, Bill Hobson was replaced by Tom Hazelmyer of Halo of Flies. He would later rejoin the band for a brief period. The band then took a three-year hiatus until 1992, at which point Gerald and Dan Hobson recruited Paul Zagores on guitar. Steve Albini produced their 1995 effort. Shortly thereafter, Erik Tunison (Die Kreuzen) replaced Dan Hobson. Jeff Ditzenberger signed on as a second guitarist a year before the band�s official break-up in 1996.